That's right. Let's do this!! It's always been something we wanted to do but we were not sure when and how to do it. Besides we're a small and are focused on finishing the new episodes of the Bino and Fino show for DVD 2 and TV. But I think we're tired of seeing scenes like in the following picture. That picture as taken in a shop in Nigeria years ago. And guess what the situation hasn't changed much. So let's get a better choice this young girl ( or boy ) . It's not about not wanting white dolls. It's about wanting more black dolls. Many more black dolls. The cool thing is that this is slowly happening. People like Taofick the founder of Queens Of Africa Dolls is leading the charge. But he can't do it all alone. So we are joining in the mission. Here's the plan. We will be getting a limited number Bino and Fino plush toys made this year. The goal is to have them ready to ship and be with you by Christmas. We are doing a pre-order campaign to help make that happen. There will be a limited number. 2,300 of each will be made. That won't be many so make sure you get yours early! 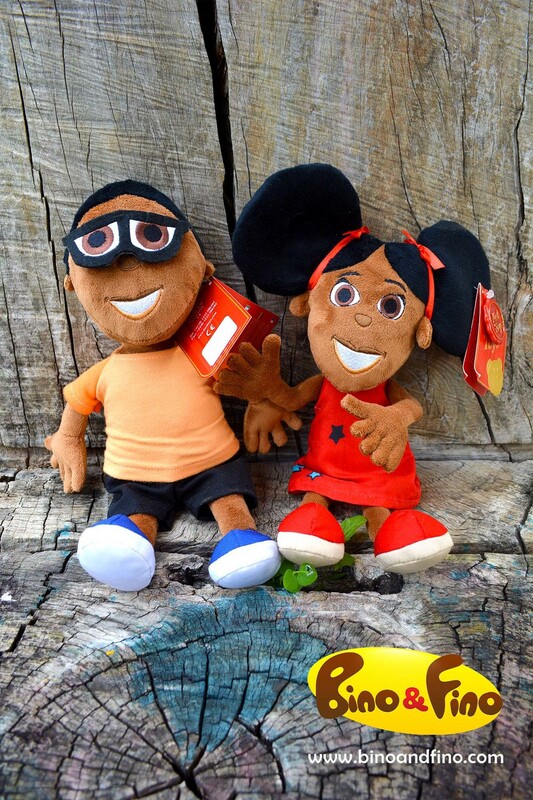 You and your kids will be one of the few in the world to own the first ever Bino and Fino plush toys. This batch and design will never be done again. Following ones will have different fabrics. We're looking into other ways to make this first pioneering group unique from any other plush toys we make. To manufacture the plush toys we are working with Keel Toys based in the U.K. as they have the expertise we need. You can see by the pictures they've done a great job already with the prototypes. The dolls will meet European safety standards EN71 and will be hand washable. The manufacturing process will take roughly 4 months. After manufacture we aim to use a company called Core Fulfilment to ship out the dolls to you around the world. If all goes well we will start shipping your dolls in November or early December. This will give us the best chance of getting them to you by Christmas. We might limit the number of countries we will ship to in order to focus things but we are not decided on that at this point. That's the plan! Will you join on this mission? To know when the pre-order campaign begins, please sign up below. Sign up with your email address and name to find out when the dolls will be available for pre-order. If you are already a member of the other Bino & Fino mailing lists then you do not need to sign up.